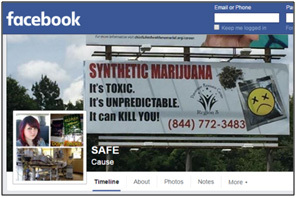 Synthetic cannabinoids are known to the general public by names such as “synthetic marijuana,” “fake pot,” and “fake weed.” This misnomer implies that synthetic cannabinoids are similar to marijuana, but nothing could be further from the truth. Although the green, leafy organic material containing synthetic cannabinoid chemicals may look similar to marijuana, this is where the likeness distinctly ends. A growing number of hospitalizations and even deaths have been reported to be associated with the use of these synthetic chemicals. Mr. Happy, Hulk, Kush and Scooby SNAX contain a randomly mixed product sprayed or coated with dangerous chemicals that can have a devastating effect. How do we know there is a problem? There was a 225% increase in exposure calls at poison centers nationwide related to synthetic cannabinoids when comparing January through May of 2014 to the same time period in 2015. The total number of cases rose from 1,115 calls in 2014 to 3,621 in 2015. In Texas, data from the Texas Poison Center Network revealed an increase in exposure calls related to synthetic cannabinoid. The total number of exposure calls related to synthetic cannabinoids for 2013 was 464 compared to 782 in 2014. This is an increase of 69% percent. What is Actually Inside These Packets? Synthetic cannabinoid products consist primarily of dried organic material that has been sprayed with a synthetic cannabinoid chemical and often, a fragrant flavoring. * Unfortunately, because they are marketed as “herbal” products, many users tend to equate the word “herbal” with safe. These packets of synthetic drugs may look professional on the outside, but nothing could be further from the truth about the product on the inside. 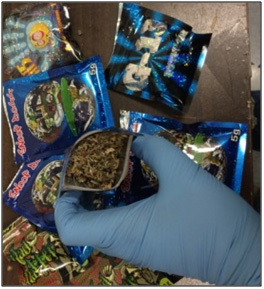 Even though some synthetic cannabinoid products are still being sold out of legitimate businesses such as convenience stores and smoke shops, these packets are actually being assembled by criminals out of garages, storage facilities, and warehouses. They are motivated purely by profit and have no regard for the health or well-being of consumers. *Note: Another form of the drug that is currently less popular is liquid synthetic cannabinoid oil that is used in conjunction with e-cigarettes. 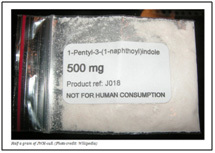 The synthetic cannabinoids being used in these products are primarily produced by chemists in China, and to a lesser extent, in other countries in Southeast Asia such as India.12 Dealers order these chemicals in a powdered form over the Internet, as can be seen in the accompanying photographs. 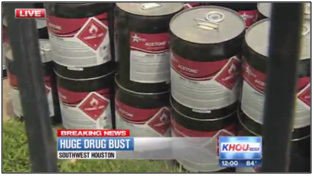 The synthetic cannabinoid powder is then mixed generally in 5, 10, or 20 gallon buckets with a solvent such as acetone, and often a fragrant flavoring such as strawberry or apple to create a liquid form of the chemical that will then be used to saturate the organic material. In some instances, large mixers are used for this process. Mullien or Damiana leaves are commonly used as the organic material in these products. These leaves are ground up into a fine tobacco-like substance. The leaves are either added to the buckets or mixers along with the chemical compound so that they become saturated or they are sprayed with the liquid chemical mixture using industrial spray bottles. The leaves are placed on drying tables, as can be seen in the photo to the left, and then the final product is packaged for distribution. Since there are no quality control checks or safety measures taking place in these clandestine manufacturing operations, there is really no way to know exactly what is in these drug-filled packets. The amount and type of chemicals can vary from one package to the next. 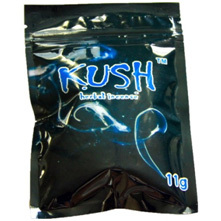 Even identically labeled packets may actually contain differing amounts and/or types of synthetic cannabinoids. Additionally, the potency can vary from dose to dose, even within the same packet. “Hot spots” in which higher concentrations of the chemicals have been applied may be present in some portions of the organic matter but not others. Most commonly, hot spots occur due to uneven spraying of the leafy material if the chemical was applied by hand using spray bottles or uneven mixing if the product was combined in a bucket or industrial mixer. The higher potency of these hot spots is of particular concern from a public health safety standpoint. Finally, because new synthetic cannabinoids are always being created to replace those that become banned, the chemicals that are in a packet of “Scooby Snax” today are not likely to be the same synthetic cannabinoids present in this brand in the near future. Thus, the same brand purchased at different times may have a completely different chemical composition and produce very different effects in the body. To adequately address the widespread public health threat from synthetic cannabinoid abuse, a multi-faceted approach is necessary. While legislation and enforcement efforts will likely reduce the supply of synthetic cannabinoids, education to increase public awareness of the danger of using these drugs is also paramount to reversing this perilous drug trend. The “To the Maximum Foundation” is a non-profit organization committed to the education and awareness of the dangers of synthetic drugs. It was founded by the family of Max Dobner, a 19 year-old young man from northern Illinois. Sadly, Max was yet another teenager who died after smoking a synthetic cannabinoid. He had purchased the drug legally from a shop in a local mall. 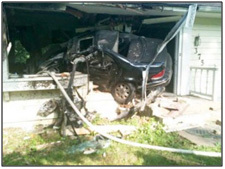 After using the drug, he began driving his car erratically at speeds of up to 80-100 miles per hour, and ultimately drove his car into a house, killing him instantly. 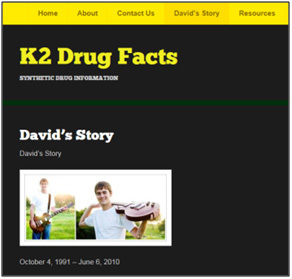 This tragedy illustrates not only the dangers of synthetic cannabinoids to the individual using the drug, but also the serious threat to public safety.92 The “To the Maximum Foundation” website addresses are http://2themax.org and http://www.tothemaximusblog.org.